I wrote in an earlier post about my first real bush walk but what I didn’t write at that time was why I didn’t think that I would enjoy it. 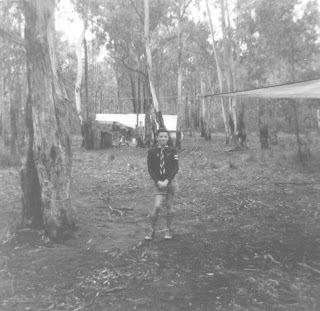 I was a cub and then a scout; a member of 9th Box Hill Troop. I’m not sure why, but the troop I belonged to was full of kids I didn’t know and I guess like my Sunday School experience, I didn’t really enjoy it. In fact I really went under sufferance and in many ways because I was forced to go. I enjoyed some of the suff we did – chalk chases and some of the other games – I never really saw a lot of point in learning how to tie knots or do some of the other stuff that earnt competency badges and I put a lo of that down to an incident that happened fairly early on in my scouting career. One weekend the troop headed off to Mt Ritchie for a camping adventure. Most kids had packs and sleeping bags, but not me, I carried a suitcase, complete with blankets and pillows. Anyone who has experienced the badge of outcast will know how stupid I felt having to lug a suitcase up a mountain track for a few miles until we got to the campsite. I have no idea what Mum and Dad were thinking sending me off like that. I’m certain they didn’t mean to humilaite me or to isolate me, and I know that we didn’t have access to things like proper hiking gear. No matter the reason it put me off wanting to hike for a long time. A suitcase for crying out loud! What were they thinking?